Red-haired Tamworth hogs are a threatened species. The heritage breed was closer to the endangered species list than the dinner table for years, driven to the brink by industrial style pig farming that wanted big pigs with high yield, not necessarily flavor. Tamworth’s survival isn’t in question nowadays thanks to the efforts of folks like La Quercia and farmers like Russ Kremer in the Missouri Ozarks. Russ's Tamworth pigs live their lives roaming and rooting in the woods. One bite of Tamworth and you’ll wonder how it ever fell out of favor. Its texture is succulent, soft. The meat looks just a little pinker than most and golden, luscious fat holds it all in place. The flavor is unmistakable and dominated by sweetness with hints of burnt sugar or caramel. 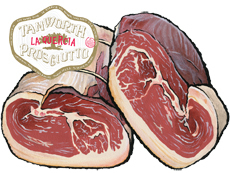 In fact it's easily the sweetest cured ham we offer from the incredible stable of La Quercia hams. The hams aren't smoked, and they're aged 12-14 months depending on the size—plenty of time to develop that deep flavor. To slice, use a sharp knife and work the ham lengthwise. Don’t worry about getting big slices—focus on keeping the pieces thin, and make sure your bite has a little bit of meat and fat. No cooking needed - this ham is best served as is, sliced as thin as you can, at room temperature. It's been cured at ambient temperatures so it's built to last. Lasts for months when stored in a cool spot. Storage instructions included.